Only minutes from mainland Cancun and located in the southern zone of the exclusive island of Isla Mujeres, this intimate, modern Mexican-Mediterranean style resort with 35 beachfront suites is in perfect harmony with the natural environment. Pamper yourself with uncompromised luxury when you retreat to your spacious, oceanfront Zoëtry Villa Rolandi suite. All of our 35 suites offer elegant Bvlgari® bath amenities, fine quality linens, a large private terrace with Jacuzzi, wireless internet, an oceanfront view, therapeutic shower, steam bath, sitting area with sofa, electronic safe, daily stocked mini bar, and maid service three times daily. Zoetry Villa Rolandi Isla Mujeres offers the finest in gourmet dining at two a la carte restaurants, where reservations are never required. Choose from an array of organic and heart-healthy à la carte dining options featuring locally grown fare and personalized dishes. Our restaurants also serve gluten-free and vegetarian dishes, and will accommodate any allergy or dietary restriction. During the day, from 11 a.m. to 6 p.m., enjoy exquisite à la carte snack specialties by the pool and beach. Whether it’s a beach or poolside meal, dinner at Casa Rolandi or Le Métissage, or a romantic dinner for two in your suite, all meals are included with Endless Privileges®. New! 24-hour dining options allow guests to enjoy late night bites at Casa Rolandi. Or stay in and order room service. It’s all available 24 hours a day. Enjoy your favorite cocktail, a fine wine, or an ice-cold beer while you take in the beautiful vista of Cancun. Choose from an array of top-shelf international and domestic spirits at our lobby bar, Cozy Bar, and bar at Casa Rolandi restaurant. You can also keep the party going with 24-hour room service and your own complimentary mini-bar. There are entertainment activities with an emphasis on culture and art with live musicians and artists performing throughout the resort. You can participate in Spanish classes, tequila tasting, pizza making or any non-motorized water activity. 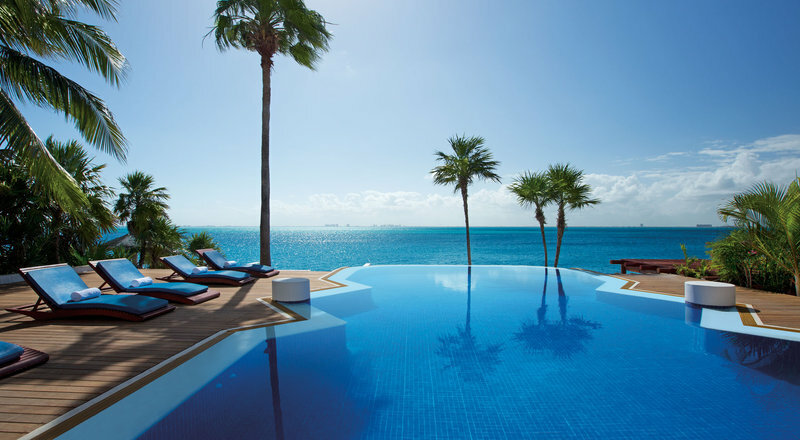 Or just lay by the beach or pool and relax with your favorite drink. You can also go to the private dock and the resorts yacht will take you across the turquoise waters to and from the dock and mainland Cancun, only 30 minutes away. While staying at Zoëtry Villa Rolandi, indulge in luxurious pampering from head to toe at our Thalasso Spa, which features thalassotherapy treatments. Our Thalasso Spa features seven treatment cabins, a saltwater pool and steam room. This tranquil, holistic wellness retreat combines relaxing, rejuvenating treatments such as personalized facials, massages, and whole body treatments. Replenish and restore your mind, body, and soul.